Are you looking for a way to get your middle schooler writing? Or do you just need a change in your middle school writing curriculum? When you give your student a book report or short essay to write, does he or she have trouble getting started? This review may include affiliate links to curriculum that we loved and used in our own homeschool. Please see our disclosure policy. When my daughter was young, say around eight years old, we used a variety of techniques to get her writing. One way was to use a daily journal where she just wrote a short paragraph or two about her day. This worked well for her until we hit middle school. As a young teen, our daughter was reluctant to write in her journal. She was not inspired to write about her day. She needed more inspiration and structure to get her going with her writing now. Does that sound like your middle schooler, too? One year, when we were at the teacher’s bookstore, I decided to look at what Spectrum had in the way of writing. I found their writing book for 6th grade. It was full of creative ideas for my middle schooler. It also offered many tips for structuring her writing as well. Have you ever looked at Spectrum Writing – Grade 6? We started with the introduction, which gave my daughter a nice review of the basics of paragraph writing. This is a great place to start if your middle schoolers struggles with paragraph writing. Spectrum breaks it down so nicely! Then each chapter offers step by step instructions, and a bunch of writing projects, too. Chapter 1 got my daughter interested in writing a story again. It was easy to follow their instructions. Chapter 2 offered a variety of essays to write. Then Chapter 3 was an introduction to persuasive writing, another type of essay writing. Start where your young teen’s interests lie. Does your child like to make up stories? Then I would do chapter 1. Do you have a middle schooler who likes to argue their point with you sometimes? Then, I would go with Chapter 3. For a basic introduction to essay writing, that would be Chapter 2. The nice thing about Spectrum Writing – Grade 6 is that you can pick and choose whichever chapter appeals best to your student! The lessons are easy to follow! I like how the each lesson is organized in a step by step manner. That way it breaks down each lesson, so that your student can go from one page to the next, as guidance is provided along the way. For example, here is a lesson on writing a personal narrative, or essay. First they explain what that is, then they provide step by step instructions for how to write one. And working on a personal narrative is a great activity for middle schoolers, as they grow and begin to discover who they are. Did you notice the bubble chart above? 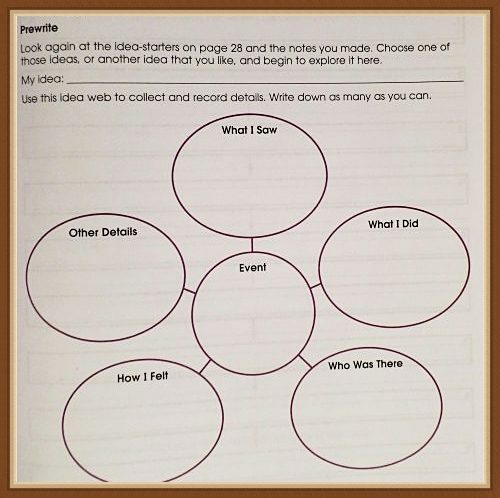 It is a great way to help your writer brainstorm and organize her initial thoughts. They use a similar approach in a lesson on Descriptive Writing, which is a part of their creative writing lessons in Chapter 1. These are all helpful skills for your middle school writer to develop. These skills will help them prepare for high school writing later. 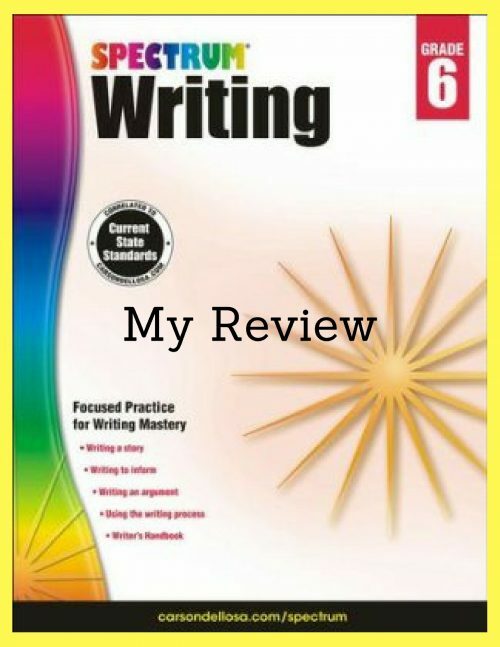 If you are looking for a helpful, step by step workbook for middle school writing, my family recommends Spectrum Writing – Grade 6. or any of the other grade levels for middle school writing. Spectrum offers writing curriculum from grades 1 – 8. I hope that you and your middle schooler will find joy in writing. Note – Spectrum has been publishing educational workbooks for years. They recently have a seal saying they fit state standards, but I wouldn’t worry about that. These workbooks look the same to me, quality helps for us homeschoolers. Betsy is mom to her now college senior, whom she homeschooled through high school. She blogs at BJ’s Homeschool, about the early years, high school, college, gifted/2e and wrote – Homeschooling High School with College in Mind. She offers free homeschool help through messages at BJ’s Consulting, and has had her articles picked up by the Huffington Post.